Infused with dynamic flavors, this Thai Paneer Satay is an excellent recreation of the traditional Indian kebab. It’s crispy, juicy and perfectly healthy! Making kebabs is a matter of patience and art. Dipped into an array of marination and smoked carefully over the fire, kebabs have filled many stomachs and won many hearts! Satay is typically famous in Southeast Asian countries. It refers to a chunk of marinated meat roasted on skewers but preparing a vegetarian version of it, I choose protein-rich paneer. I marinated the paneer in coconut milk, Thai curry paste, and a variety of complementing sauces. The overnight marination transformed the paneer into savory goodness! The delicious Thai flavors seeped deep into the paneer and when grilled over the fire, enhancing the tang with a hint of smokiness. Complementing the Thai Satay, I prepared a peanut sauce too. With sweet, spicy flavor and small bits of nuts throughout, it turned out to be a great accompaniment. It offered so much texture and flavor, that it would be a crime to serve the satay without it. Just waiting to be eaten, this Thai Paneer Satay features melange of flavors and is sure to be loved by all! Infused with dynamic flavors, this Thai Paneer Satay is an excellent recreation of the traditional Indian kebab. Marinated in coconut milk , lemongrass and Thai curry paste, and grilled on fire, these kebabs are just waiting to be eaten! Soak the skewers in water 3-4 hours prior to marination. Make sure to dry them before use. Cut the paneer into roughly 15-17 equally sized strips that are about 1/2 inch in thickness and 3-4 inches long. Put a skewer in each strip so that it’s about half of the way inside. In a deep bowl whisk together all of the ingredients for the marinade. Adjust the seasoning according to your taste. 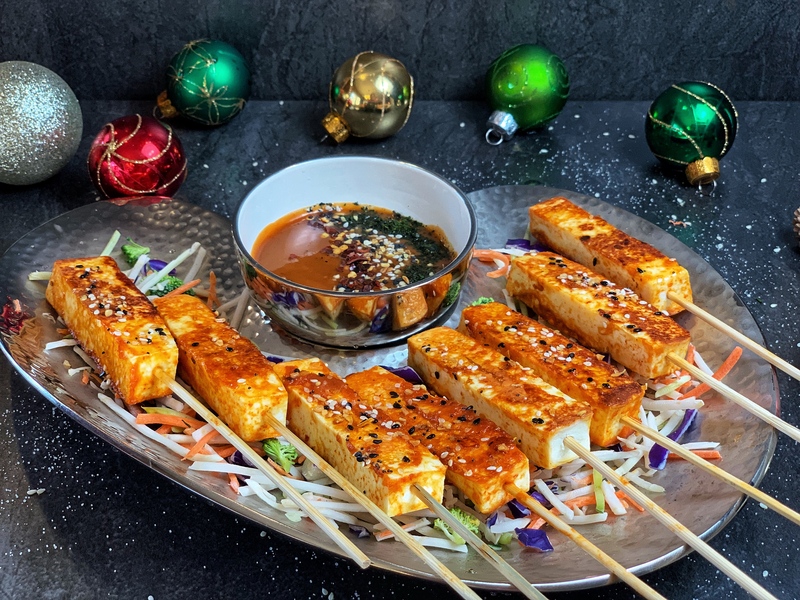 Stick the paneer skewers into the marinade so that they are fully submerged in the marinade. Cover the bowl with plastic wrap and let sit in the fridge for at least 5 hours, but ideally overnight. For the sauce, whisk together all of the ingredients except the water. Once they are incorporated, the warm water can be added as needed to achieve the desired consistency of the sauce. This sauce can be stored in the fridge until it’s time to serve. After marination, take out the paneer skewers and grill them in batches of 4-5 on a nonstick pan on medium heat. Make sure not to add any oil when grilling them. Keep turning the skewers every 30 seconds or so to ensure an even cook. Brush the marinade on the sides of the skewers during grilling. Once they are golden brown, garnish with sesame seeds, basil, and chili flakes. Serve with the dipping sauce and enjoy! The skewers can also be grilled on medium and should take about 2 minutes per side as they are fairly thin. Be sure that they don’t burn since the flame is much hotter. Oil isn’t needed when cooking because the heat makes the coconut milk separate into fat and coconut oil. Subscribe to my YouTube Channel for step-by-step videos. Don’t forget to tag @naturallynidhi on Instagram and hashtag it #naturallynidhi. You can also post your pictures to my facebook page. I’d love to hear how the recipe turned out and what you think in the comment section below. Find me on and share your creation with me! Hello! Welcome to my culinary journey through the vast and flavorful world of vegetarian food. Get the latest recipes by email.